The former England international has recently been touted to join the Gunners amid the injury crisis which has hampered their central defensive department. 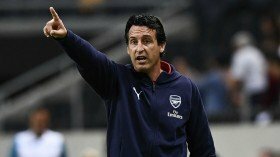 However, speaking after the Fulham game, Emery has stressed that is not the case with the club holding no contact with the Englishman, he said: "We didn't speak about him." Arsenal are currently left with just two fit central defenders in the form of Laurent Koscielny and Sokratis Papastathopoulos after the recent injury to Shkodran Mustafi. But, the German may not be sidelined for an extended period with Emery clarifying that the hamstring problem is only a minor one which could keep him out of action for a few days. Arsenal are currently two points behind Chelsea in the race for the final Champions League spot, though the Blues have an additional game in hand to play.